I noticed we had a fair number of WI and IL bowlers on the site, so I was wondering if any bowl in this tournament? I've read a lot about i and it sounds like a nightmare, but still people come back to bowl it. I've never been in a tournament, and this is probably the worst "first" tournament to try, but I know someone with an opening on their squad and am tempted to try it out for fun/pain. If anyone has gone, any tips beyond "throw it hard and straight at the head pin"? Ive heard that from several people by now. I bowled it once. That was enough for me. $85 dollars to go get completely abused for 6 or 8 games (I am trying to forget it). They have the lanes surrounded by a huge wooden box. That way you can't see what how they are dressing the lanes. The far left lane has no oil on it. When I say no oil, I mean NO OIL!!!!!! I took my red pearl shadow and was hooking the lane. Trying to throw it hard and straight might work on some lanes, but not all. Why? Cause on some of the lanes, the ball backs up. Literally backs up. There is so much oil on the lane that the ball backs up. Best to have a ball that will hook a ton and one that doesn't move. There is a lane where the left side is dry, the right oily, every other board has oil, checker board pattern. You name it, they have it. Tough stuff. They also have a lumberjack tourney. 5lb pins. I can't remember if it is 9pin no tap or not. It takes a lot of force to knock over 10 5lb pins. Again, tough. I know a lot of people who still bowl it. Year after year, they go back. I guess that abuse is fun for some. Not me. Just plan on lofting the ball past the arrows on the lane with no oil in the front half. And, did they tell you there is a screen that you roll under that blocks your view of the pins? The screens are pictures of past champions. Makes it hard to see anything past the arrows. You kind of have to duck around them to see. I saw some videos on youtube, that did look pretty annoying. The screens are pictures of past champions. Makes it hard to see anything past the arrows. One thing not mentioned is there are no lane markers at all, no dots or arrows on the lane, no dots on the approaches. I bowled this tournament once about 6 years ago, I keep saying I am going to do it every year but I just get lazy and don't although its pretty much in my backyard. 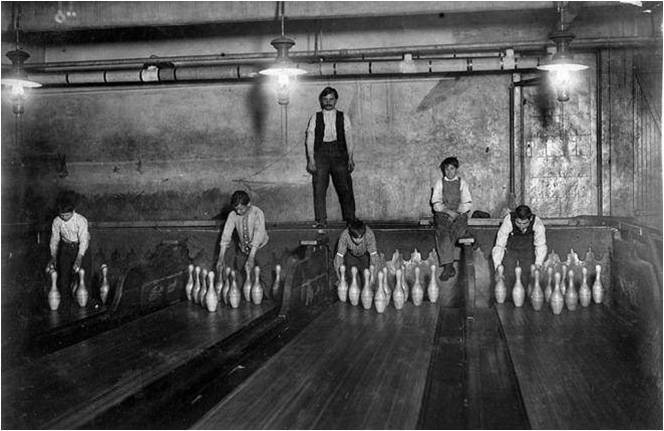 I am a cranker (about 560 rev rate) and even a snow tire wouldn't grab on to the oiled lanes so after a few games I just took my plastic ball and threw it straight to the pocket, seemed to be the best way to play it. The pins are often offspot and you aren't allowed reracks, some are different weights, as mentioned already there is a board about 4 feet above the lanes blocking your view, and there is no practice, you go straight into the game. You are allowed only two balls and one equipment pouch, I think there are several other things but they aren't coming to mind right now. Yes you will be embarassed to tell others your scores but its an experience and its the most fun you will have bowling terrible. I think Pete Weber once shot a 104 at the peterson. I bowled the Pete for the first time this year. All I can say is that it is something that every bowler should do at least once in their lifetime. I heard all the stories, etc. before I bowled, but nothing could get me ready for the real thing. I'd say just be prepared to bowl poorly. I did get to see PJ Haggerty almost leave a pocket 4-5-6. I am not a big tournament bowler but I enjoyed the Petersen the 2 years I went. My dad always did very well at the Petersen so I went with him for 2 straight years and what an experience! I will go back when the wife and I get back on our feet. It's a love/hate tournament, I actually enjoy the challenge. I took 2 balls, a Hammer Diesel and a Columbia White Dot. My 2nd year I had high game (255 thrown w/ the White Dot) and high series (635) in our squad and got back $90, so that paid for my entry. Shows some of the squads still looking for bowlers. As one of the hundreds of Petersen Squad Sponsors - we need the continued participation of League and non-league bowlers to keep this tournament running. As of 06/17/2017 01:55 PM - Still have spots available for 06/24/2017 @ 03:30 PM Petersen Squad - 8 games over 16 lanes. Our Group also has a Golf outing scheduled for 06/23/2017 @ Silver Ridge - South of Rockford - Tee Times beginning @ 2 PM. Post me at [email protected] or 515-795-3076 for details.